The percentage of Americans working in the gig economy has shrunk to 10.1 today from 10.7 in 2005, the Department of Labor (DOL) claims in an unreleased June study, according to Bloomberg Law. The report seems to contradict other assessments that put gig workers at 33 percent of the American workforce. The DOL report, however, does not include gig workers who held other employment and used the gig economy as a supplementary source of income. The DOL numbers came to light after it released another assessment on Sept. 28 saying that just 1 percent of American workers earn their money outside the 9-to-5 by using smartphone apps and websites. The JPMorgan Chase Institute, however, pegs that percentage at 1.6. Meanwhile, DOL Secretary Alexander Acosta says his agency is looking at drafting new rules for workers in the gig economy. “The workforce is changing. 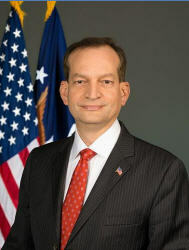 How we approach work is changing, and we need to start looking at our rules and recognize that what fit 20 or 30 years ago is not going to fit for the modern workplace,” Acosta told Bloomberg Law. At issue is the job status of those who work for establishments like Amazon, Uber, Lyft Inc., FedEx Corp., Shell Oil Co., and a slew of exotic dancing locations. These firms have come under increasing legal fire for classifying their workers (or a segment of their workers) as independent contractors when the companies often dictate work conditions and even hours of employment. The California Supreme Court has issued an A-B-C test for determining who’s an independent contractor, and it appears that most of those working in the gig economy — under this standard — should be considered employees and be eligible for benefits and the protections of the Fair Labor Standards Act (FLSA). The three factors in the Supreme Court definition are a business has to prove that 1) the worker controls how the job is done, 2) the work is not within the usual course of the company’s business, and 3) the worker is “customarily engaged” in an independent trade or occupation.